The scene opened with the views of the fortified temple, now in ruins, smoke billowing from the tattered remains. Screams and shouting as well as the creaking of wood set on fire filled the air. Chaos always followed Oda Nobunada where he went, but generally it affected his enemies more than his own forces. Today was proving to be a very special day, as everything seemed upside down. Oda warriors ran in all directions, prey of fear and lack of leadership and morale. Everything seems to be happening in slow motion for your eyes. The six of you were awestruck, mouth agape as everything happened around you. A stray ashigaru, the footsoldiers of the army, ran into your midst, bumping against Akihito’s horse, as he was looking at his back without paying attention to where he was going. Bōfū, being the trained and smart animal he was, barely reacted to that. The ashigaru scrambled to his feet and ran away. The small incident took you out of your stupor, and you regained your senses. In front of you, Zenshō-ji laid destroyed. To your backs you have the forest of Owari, and your left leads to the fortified town by the same name, where the Oda clan’s fortress lies. Looking to your right, you see the banners of Imagawa Yoshimoto raising in front of the dying sun. Yahata could feel his heart pounding at the excitement of war about to break loose, but then he realises he is now on the loosing side of the conflict. Imagawa probably heard the commotion and was marching to the temple to seize the chance and crush the remaining Oda forces. The sheer dishonour of that made Dai Jin sick of her stomach. The enemy would be at the temple in about an hour, unless they sent their cavalry first, in which case 15 minutes would be all that it takes before the raiders arrive. The wind suddenly changes direction, and started blowing from the south. Soyokaze is reminded of the bad omen this represents, and Hama can feel the humidity raising up in the air. A storm was brewing, no doubt about it. Of the six, only Kuro was grateful at the coming of the night and the darkness that would soon cover everything. Regardless, if was imperative that the virtuous six decide what to do next. "I hate to even suggest this,but we need to get out of the area NOW before Imagawa's Horemen get here. Kuro,you have better sight in the darkness,so lead us to Owari.Ounce we get behind some walls,we'll look at our Options to find Lord Nobunaga...."
Kuro crouched close to the ground, every fibre of his being tensing as he yearned to leap into the fray. He could practically taste the carnage about to unfold here. How could this have happened? Nobunaga-sama had gone missing and all was in chaos and disarray around them. The yokai snapped his head to the direction of the approaching enemy army, then towards the forest and finally to the fortified town. "Death flows all around us. Death on this coming field of slaughter, death in the destroyed temple and death in the teeth of the approaching enemy army. Only those lacking the wits to see this or those too frozen by fear to act will stand here." The certainty of his voice cut through the din around them like steel through reeds. He turned towards Akihito after he spoke, regarding the human for an uncomfortably long moment before shaking his head. "We can disappear into the forest in the darkness more easily then we can escape an encircled town." Last edited by McGuffin on Thu May 31, 2018 7:16 pm, edited 1 time in total. "We must check for survivors within the temple." The old man says, though the prospects were bleak for such. He starts to scramble out from their observation position. "Then where!? ", Hama snarls at a pair of trembling soldiers before her, her brow furrowed and her narrowed eyes darting between them. With a long hiss of irritation, she releases her mystic hold on the men's legs, pacing as she surveys the blazing temple before whipping her head around at Soyokaze's voice. "Two storms are coming, old man. Neither of them will leave those men in a burning temple, and I doubt you could weather either!" she snaps at Soyokaze, "If we survive this night it will not be here!" She turns away from Soyokaze as he moves away, facing towards Akihito and Kuroi before nodding once "A bowman and a nightbeast seem the perfect pair to instruct the rest of us on how to run away. Should it begin to rain, my vision will surely outstrip this thing's, but until that time I shall have to trust in you." she says, before her attention is drawn by a flaming timber collapsing in the temple. Hama spits in irritation, whirling once more to face the remaining members of the small band. "And what of you honor-blind idiots, will you be wasting your blood here or coming with us!?" she demands of Dai Jin and Yahata. "Come on,we can't let sofu go on his own or he'll get killed...."
Hey,that was a good roll! Kuro scoffed in annoyance as Soyokaze did what he always did and acted according to his heart instead of his head. He could never understand what drew him so to the humans. He reached out to grab the old healer. "Stop, you old fool. Even you should have the wisdom to see that anyone still in the temple is as dead as any caught on the field of battle here by the Imagawa forces. Follow the archer to the town, at least there you can still be of some use there." Kuro looked to Akihito. "Lead the way." He picked his way less stealthily after the former Yakuza, his impatience clear to see in his carelessness. The woman looks upon the destruction, her teeth grit in anger. At the cowardly tactics employed to destroy the temple, at the man himself who's army marched on, at her own lord for vanishing at such a time, and at herself for the very fact there was nothing that could be done. To go into the flames would be foolish no matter how much she wished to, in her heart she knew that this battle was lost. If she were to go in now, she may as well have just thrown herself upon her sword. "Enough, Hama! Do not think us so dull and blind to not realize when it's time for us to take our leave. Lǎorén, you can not help these people any more then I can take on that hún dàn and his band of fools. Save your alchemy for those that can still be saved yet. After he's done here, he's sure to march upon Owari. If you were to perish here in a vain attempt to save those already dead, who will help to heal the woman and children once their forces spill into it's streets?" ...Maybe he'll listen to reason? A very young-looking man with a white dove perched upon his shoulder looked on at the destruction of the temple, his emotions torn between repulsion and appreciation. As a connoisseur of the ways of war, this tactic was awfully underhanded... but admittedly effective. 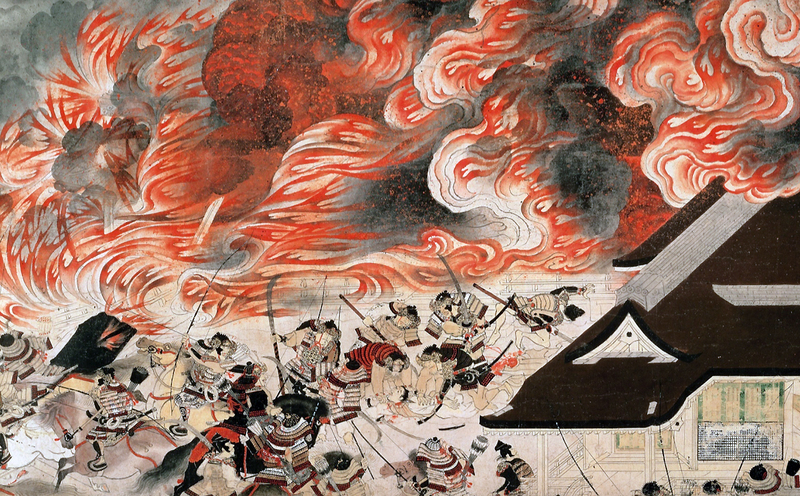 The disarray it had generated in Oda Nobunada's army was swift and widespread. Yahata cursed his current weakness. Were he at the height of his power, and if Amaterasu commanded it to be, he could lay waste to Imagawa's forces with his godlike power and a flock of magical doves. For now though, his current strength and Jingu was what he had to make due with, and he was not foolish enough to see himself victorious in this fight. The bird flutters its wings. "Do not think us so dull and blind to not realize when it's time for us to take our leave." "I have no intentions of dying here today," Yahata boasted to Hama with a smirk, sticking a thumb to his chest. "But trapped under burning rubble, waiting to be killed, is no way for a warrior to die. Soyokaze and I can be in and out; we'll be back in the presence of your sparkling personality before you know it, Hama! he said with no hint of sarcasm. OOC: You said it would be, at the earliest, 15 minutes for enemies to arrive. Was that something we have a sense of automatically, or do we need to roll something? I have Expertise: Warfare if that works, which I can take 10 on with Skill Mastery for a total of 20. Also, how far away from the temple are we? Is running there for an in-and-out search feasible? Yahata can move at Speed 1 (Speed 2 with a 4 or more on Athletics), and Soyokaze has Flight 2. Last edited by Bill from Accounting on Fri Jun 01, 2018 6:56 am, edited 1 time in total. "This young fool, that old fool, the entire lot of you!" Hama exclaims as she notices Akihito and Kuroi following Soyokaze. She glares and mutters to herself "That lying fool had best not be in there still." A moment later she turns and, with a smile that doesn't reach her eyes, announces "Very well! Old man, young warrior, I shall have us all to the temple in the blink of an eye, I shall find any who still live within it so you may singe yourselves saving them, I shall whisk us away after. And in return you two shall owe me a single favor each. Or will you instead stumble your way there and flail at rubble until Imagawa arrives?" Soyokaze pauses to consider Dai Jin's words, the blademistress made a very good point, then Hama offered to get them there quicker. "You would do this, not for favors from us, WaterMaid, but as a gamble that the man who could give you the glory you seek yet lives. I do this because life is precious and if there is even a chance to preserve some, I must try. As I would do for any of you." "You have a sense of bodies - flesh and blood, do you not, Hama-san? it will not take long to determine if our aid is of value." the old man says. "If it's required to get your aid here,then I'LL owe you the favor personally...."
"sofu,i know you might not like to hear this but we may already be too late to save anyone.We'll still try, but only for a few minutes.Then we must get to Owari, to see to those whom we can...."
She spat to the side, with several comments in the language of Ming. "Senseless bravery it is then. I won't simply stand by and let all of you get slaughtered if his horsemen arrive." Drawing her sword from it's sheath, she started to tun in the direction of the temple. But where they were aiming to save those trapped within, she wad aiming to place herself before the oncoming army itself. "Be quick! Even with my training, I'll never be able to hold back the tide forever." Jin is moving to place herself as a target for the cavaliers to go for first. Taking a defend action when she get's there, otherwise readying for the first attack. "Ha! See old man, this is what generosity and good will looks like. Well said, Akihito!" Hama exclaims as her hair begins to ripple and her eyes glow faintly. The entire group suddenly lifts into the air with a sharp snap of movement and a cry of "Don't leave sight! ", more sudden yanks keeping everyone from crashing against the side of the temple or the ground below. All party members can now be flung around at speed rank 7, in luckily the appropriate ways to get where they want to go without any injuries. She grit her teeth as she felt the woman's control flow over her body, forcing it to glide over the land like a dragon. It was not a pleasent sensation, but it was one she would tolerate. In just a few short steps, she was in place, her sword poised against the entire might of the Imagawa.